It’s not that I don’t know how to cook or that I don’t want to cook – I just don’t have the counterspace to do so in my tiny New York apartment. At least, that’s what I tell my mom about my constant take-out habits. Y-Combinator backed Tovala aims to fix this issue for many young professionals and busy parents by taking the Blue Apron model of DIY dinner kits and creating an appliance for you to actually cook your meals in. The business is split into three parts: First, the hardware is a smart oven that can read barcodes from premade Tovala meals so it knows how to cook each meal (steam, broil, bake, convection), at what temperature, and for how long. Second, the app lets users control the cook time and get notified when their meals are ready. They can also customize cooking presets for when they’re not heating up Tovala-approved meals. Lastly, the food delivery subscription lets users choose from weekly menu rotations of meals created by a team of professional chefs. In my demo, we cooked a spinach, cheese and mushroom-stuffed chicken breast with a side of asparagus topped with a lemon pesto sauce. 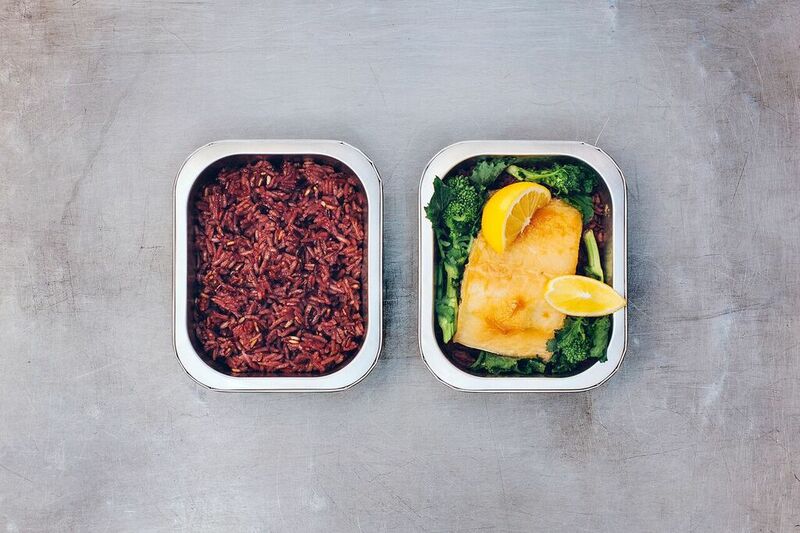 The protein and vegetable come in two separate tinfoil containers, and they pop into the Tovala oven together as they are designed to cook at the same temperature for the same amount of time, making dinner ready in 15 minutes. Literally the only thing you can screw up is burning your hands taking food out. Tovala meals are purposely designed to take between 15 to 30 minutes to completely cook, and will offer meals that cater to various dietary needs (kosher, paleo, vegetarian, etc.) Tovala co-founder David Rabie says the company has already raised $500,000 in funding, but it now looks to Kickstarter to make an additional push and secure the first set of buyers before shipping in Q4 of this year. At launch, Rabie says it will have two facilities creating and shipping the meals out across the United States to get fresh ingredients out to customers without freezing or adding preservatives. Over time, Tovala hopes to grow a community where users can submit their own recipes and earn royalties for popular meals that become a Tovala-approved menu item. It’d also be interesting to see Tovala take a Keurig-like model in which it partners with local supermarket chains to create barcodes for fresh, pre-packaged foods that can be instantly cooked in its smart oven. God knows even the most technologically-apt millennial can manage to burn microwave popcorn. A limited early bird pledge of $199 will get you the oven, with each meal estimated to cost $15 per portion. After the discounted pledges are sold out, the Tovala oven is expected to retail between $330 to $400. Maybe it’s not the cheapest appliance out there, but when you compare it to another smart oven that launched last summer at the price of $1,495, it makes Tovala look like a bargain.